The axis of the ECG is the major direction of the overall electrical activity of the heart. 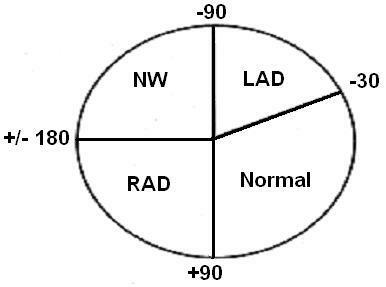 It can be normal, leftward (left axis deviation, or LAD), rightward (right axis deviation, or RAD) or indeterminate (northwest axis). The QRS axis is the most important to determine. However, the P wave or T wave axis can also be measured. To determine the QRS axis, the limb leads (not the precordial leads) need to be examined. The depiction of the standard leads and their relationship to the cardiac axis is below. Note that lead I is at zero degrees, lead II is at +60 degrees, and lead III is at +120 degrees. Lead aVL (L for left arm) is at -30 degrees and lead aVF (F for foot) is at +90 degrees. The negative of lead aVR (R for right arm) is at +30 degrees; the positive of lead aVR is actually at -150 degrees. Although memorizing the above picture is crucial to accurately determining axis, some shortcuts to quickly determine the axis are outlined below. The normal QRS axis should be between -30 and +90 degrees. Left axis deviation is defined as the major QRS vector, falling between -30 and -90 degrees. Right axis deviation occurs with the QRS axis and is between +90 and +180 degrees. Indeterminate axis is between +/- 180 and -90 degrees. This is summarized in the image below. 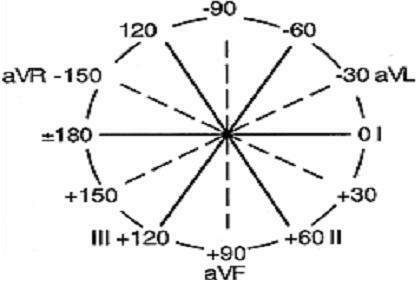 The fastest non-specific method to determine the QRS axis is to find the major direction of the QRS complex — positive or negative — in leads I and aVF. If the QRS complex is upright (positive) in both lead I and lead aVF, then the axis is normal. The image below demonstrates this example, with the electrical vector heading towards the positive of lead I and the positive of lead aVF, as indicated by the arrows. The QRS axis is thus between these two arrows, which falls within the normal range. If the QRS is upright in lead I (positive) and downward in lead aVF (negative), then the axis is between 0 and -90 degrees. However, recalling that left axis deviation is defined as between -30 and -90, this scenario is not always technically left axis deviation. In this scenario, the QRS axis could fall between 0 and -30, which is within normal limits. To further distinguish normal from left axis deviation in this setting, look at lead II. If lead II is downward (negative), then the axis is more towards -120, and left axis deviation is present. If the QRS complex in lead II is upright (positive), then the axis is more towards +60 degrees, and the QRS axis is normal. The causes of LAD are listed below. Note that the first three account for almost 90% of ECG tracings with LAD. Below is an example of LAD to help visualize the above explanation. If the QRS is predominantly negative in lead I and positive in lead aVF, then the axis is rightward (right axis deviation). The causes of RAD are listed below. Below is a pictorial example of RAD. If the QRS is downward (negative) in lead I and downward (negative) in lead aVF, then the axis is indeterminate and sometimes referred to as “northwestern axis.” This finding is uncommon and usually from ventricular rhythms; however, it can also be from paced rhythms, lead misplacement and certain congenital heart diseases.